The language of Braille, similar to the form still used today, was invented in the 19th century by Louis Braille, a student at the National Institute for Blind Youth in Paris, France. After experiencing frustration with the ineffectiveness of the day’s current reading system for the blind, which primarily consisted of tracing raised letters with one’s fingers, a young Mr. Braille created an improved reading system. This new method, which was loosely based on a touch-based military code, used raised dots. Once learned, braille enabled reading at a much faster pace. The braille signs and tactile signs present today help blind people and the visually impaired better navigate today’s busy streets, buildings, and cities. 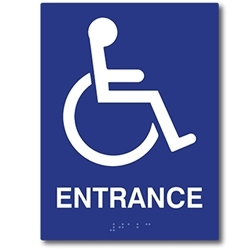 The posting of braille exit signs as well as other types of ADA signs are now required for buildings, offices, and properties that are open to the general public (including businesses, non-profits and government entities). The American with Disabilities Act (ADA), which made it a requirement that such braille signage be posted, makes changes to the law as needed. Businesses and government entities that fail to post the proper braille and tactile signage can face heavy fines and penalties. As with the development of braille and the standardization of braille signage, updates had to be made overtime so that the braille and tactile signage was the same across all ADA signage. Did you know that technically, there are three different kinds of Braille? The current and most recent update, which had been used in the State of California for some time, requires all braille signs to use Contracted Braille or “Grade 2” Braille. This version uses widely understood language contractions to improve readability while reducing space. The newest form of the tactile signage is also recognized for its domed rather than flat raised dots, which are easier for the blind and visually impaired to read and discern.